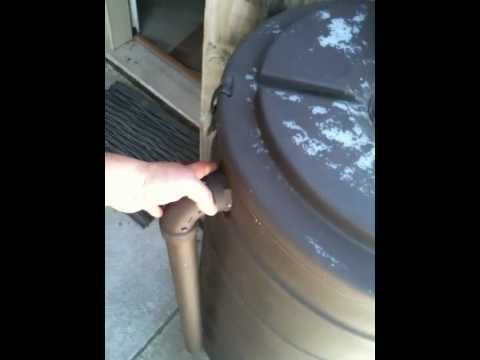 Building a rain barrel is easy. I purchased four 55 Gallon Reconditioned Poly Drums. They told me these were used pickle barrels. New these drums were $50 each, reconditioned and no longer usable for food, they were still like new and only $17 each. I added a 90 degree elbow and about 2' of 2" pipe as an overflow, drilled drain/intake holes in the lid, and hot glued window screen to the lid and inside the drum to assure no bug made thier way into the barrels. I also drilled a hole and added a threaded faucet. I "wanted" to use plastic specific paint, but my wife insisted on using regular spray paint and as you can see it flaked off. Draining the barrels provides a nice steady stream flow of water for plants as long as the hose end is below the waterline. I have also used a submersible pump for some high pressure yard sprinkler-ing. I collect 200 gallons of purify-able drinking water every time it rains enough for my family to live comfortably with water for 2-3 months at a time... what's you plan if you don't have power or there is a natural disaster? Also as a non-tree hugging plus, having these water barrels also prevents all my landscaping mulch from washing away during heavy rains. The initial water stream shock is captured in the rain barrels.